© Borgonovo et al. ; Licensee Bentham Open. Oral fistula (OAF) is a pathological communication between the oral cavity and maxillary sinus which has its origin either from iatrogenic complications or from dental infections, osteomyelitis, radiation therapy or trauma. OAF closures can be achieved using different flaps which show both advantages and limitations. Therefore they all need careful consideration in order to select the best approach depending on the situation. The most widely employed flaps are of three types: vestibular flap, palatal flap and buccal fat pad Flap(BFP). The authors present three cases of OAF with the different techniques. 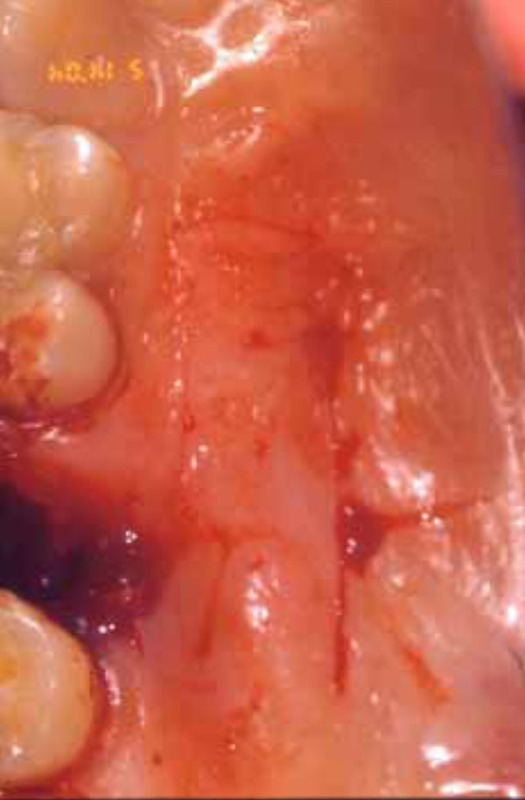 It is suggested that the buccal flap is best applied in the case of large fistulas located in the anterior region, the palatal flap is suitable to correct premolar defects and the BFP flap for wide posterior OAFs. Keywords: Buccal flap, buccal pad of fat, oroantral fistula, palatal flap. The oroantral fistula (OAF) is a pathological communication between the oral cavity and the maxillary sinus; depending on the location it can be classified as alveolo-sinusal, palatal-sinusal and vestibulo-sinusal. These kinds of communications arise mainly after extraction of posterior maxillary teeth due to the close anatomical relationship between the root apices of the molar and premolar teeth and the sinus floor. In addition, a fistula might originate following removal of maxillary cysts, benign or malignant tumors or trauma. It must be emphasised that unlike the oro-antral communication (OAC), OAF is characterized by the presence of epithelium arising from the oral mucosa and/or from the antral sinus mucosa that, if not removed, could inhibit spontaneous healing. Closing this communication is important to avoid food and saliva contamination that could lead to bacterial infection, impaired healing and chronic sinusitis. OAF is apparently more frequent in male than in female subjects. Radiological observations might show a sinus floor discontinuity, sinus opacity, focal alveolar atrophy and associated periodontal disease. The choice of the appropriate therapy must take into consideration the width, epithelialization and presence or absence of infections. Defects less than 3mm in width and without epithelialization might heal spontaneously in the absence of infections. In the latter case, infection must be cured before surgery to avoid impaired drainage. Communications wider than 5mm require the use of rotating and sliding flaps to provide closure. The aims of this study are to describe and compare the three most common techniques employed in surgical closure of oroantral fistulas, explaining both the advantages and disadvantages of each. The term oroantral fistula is meant to indicate a canal lined by epithelium that may be filled by granulation tissue or by polyposis of the sinus membrane, most frequently due to iatrogenic oroantral communication. OAF could be caused by dental infection, osteomyelitis, radiation therapy, trauma or following removal of maxillary cysts or tumors. The extraction of maxillary posterior teeth represents the most common etiology of OAF due to the proximity of the bicuspid apices and molars to the antrum. Alternatively, OAF might arise during preparation of bone for insertion of a dental implant as a consequence of poor surgical planning. Most of the minor communications, having a diameter of 1-2mm, heal spontaneously in the absence of infection. When chronic oroantral fistula defects are wider than 5mm and persist for more than 3 weeks, a secondary surgical intervention is required . This type of OAF will develop an epithelium similar to the pseudo stratified ciliated columnar respiratory cells of the maxillary antrum and to those of the squamous epithelium of the oral mucosa. The fistula must be quickly closed since its persistence increases the possible inflammation of the sinus through contamination of the oral cavity. It is important to establish whether or not sinus infection has occurred  Sinus infection can occur with any size and duration of fistula canal. Different flap designs for OAFs closure have been described in the literature, each of which present both advantages and disadvantages. We describe three patients who arrived in the authors’ department after failure of dental treatment. The above-discussed surgical techniques have been utilized to close the OAF following careful examination of the patient. Patient N. 1 was submitted to buccal flap surgery due to a traumatic upper second premolar extraction. In 1930 Axhausen  described the use of a buccal flap with a thin layer of buccinator muscle to close an oroantral defect. Later, Berger  reported a buccal sliding flap technique, which is still in use, as a tool to close small to medium size (< 1cm) lateral or midalveolar fistulas, located either laterally or in the middle of the alveolar process. Krompotie and Bagatin  reported the immediate closure of an oroantral communication by means of a rotating gingivovestibular flap. This technique can also be employed for closing oroantral fistulas. It consists of a modification of a vestibular flap in order to avoid lowering of the vestibular sulcus, an event that takes normally place when using vestibular flaps. After cutting the communication edges, two vertical release incisions are made to provide a flap with dimensions suitable for closure of the antral communication. 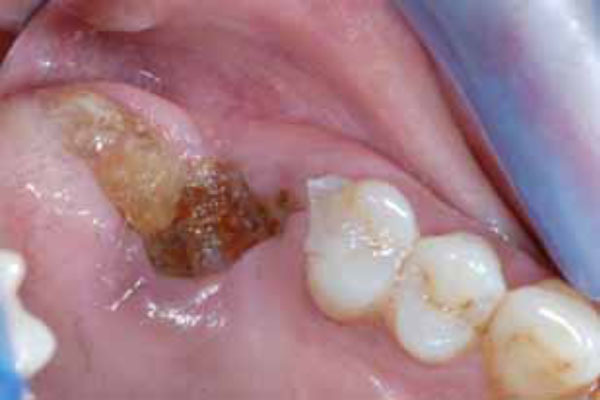 Incision removal of the epithelial lining of the palatal mucosa behind the communication might also be required. The flap, having a trapezoidal shape, consists of both epithelium and connective tissue, and it is positioned over the defect by means of mattress sutures from the buccal flap to the palatal mucosa. The advantage of the buccal flap procedure is its possible utilization when the alveolar ridge is very resorbed and the fistula is located in a more mesial area . However the loss of the vestibule represents a serious problem requiring an additional vestibuloplasty in patients wearing removable dentures. 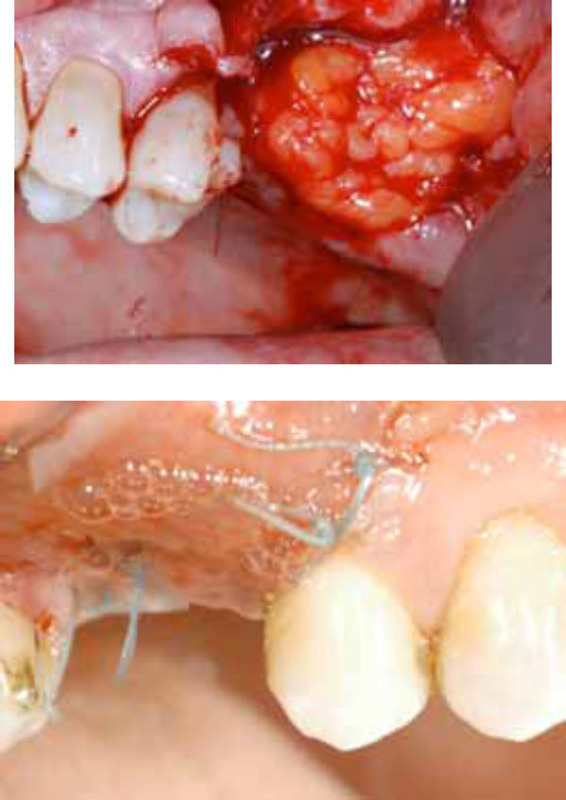 Patient N. 2 received buccal flap surgery due to traumatic extraction of the first upper molar. The first description of a procedure for closing oroantral fistulas using a palatal full thickness flap dates back to Ashley . The advantage of this method is the use of mucous membrane from the hard palate. In 1980 Ehrl demonstrated the possibility of employing this technique with wide fistulas of 1cm in diameter . Yamazaki and coworkers [9, 10] further improved this technique by adding to the connective tissue island a flap of mucosa to cover the raw area of palatal bone.The bone is covered and the island flap retains excellent mobility without causing bunching of the mucosa of the hard palate and recipient site. 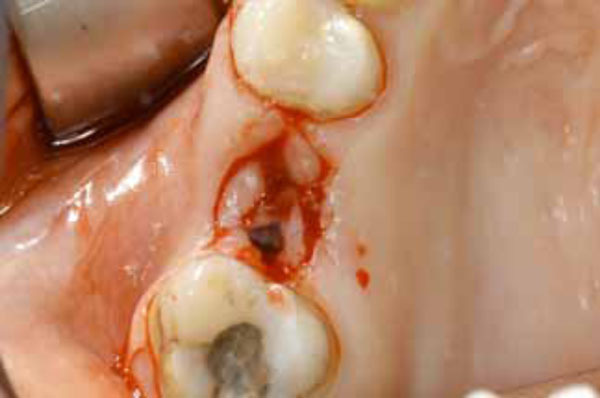 Moreover this method allows replacement of the denture a short time after the wound healing. The bone surface is preserved since the periosteum is not involved. Using flaps of partial thickness avoids the occurrence of necrosis even in the case of wide OAFs caused by removal of large cysts or tumors. The first step consists in excising the epithelium from its edges and in cutting the palatal fibro-mucosa so as to create a flap having an axial stalk with a posterior base, supplied by the greater palatine artery. The palatal flap with its total thickness laterally rotated must have a large base to include the greater palatine artery at the site of its exit from the foramen . The anterior extension of the flap must exceed the diameter of the bony defect and have a length sufficient to allow its lateral rotation and the replacement and the suture without exerting tension on the vestibular mucosa . 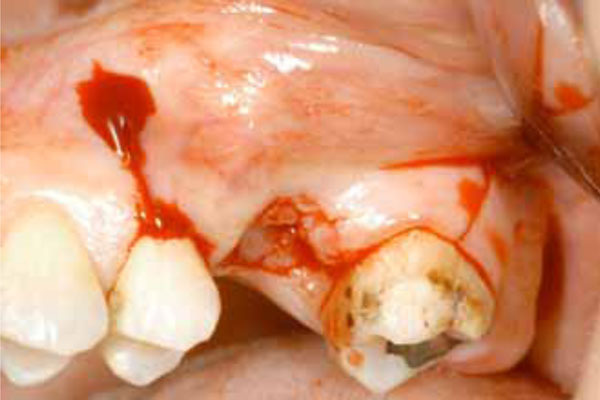 However this type of flap is only indicated for closing fistulas in the premolar area since an excessive rotation required when operating in the molar region could cause ischemia of the flap due to the palatal artery occlusion and necrosis. Advantages of the palatal flap include good vascularization, adequate thickness and optimal tissue quality. 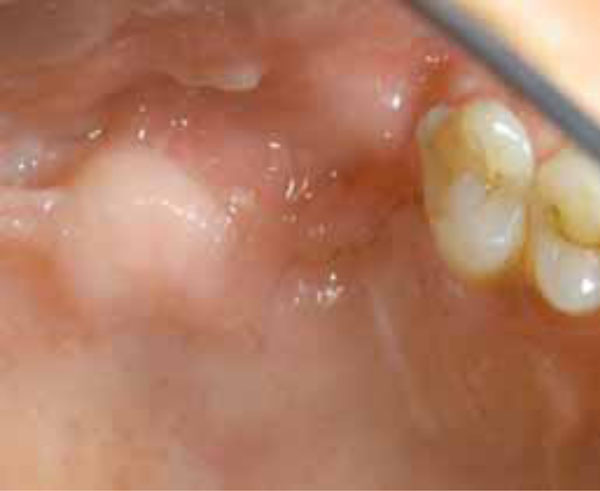 However as a consequence of this technique, exposure of the bony palatal surface, pain and later surface irregularities of the surgical area due to secondary epithelialization two or three months later, are often observed. 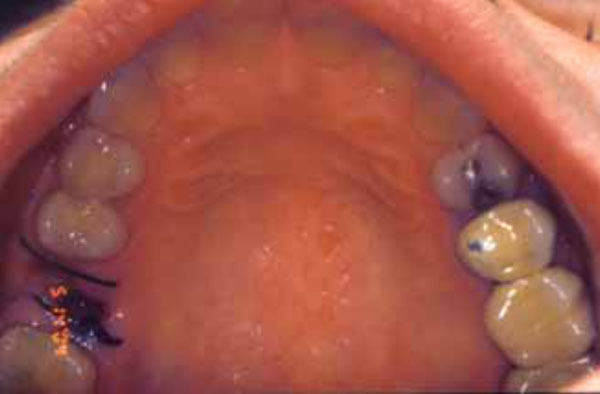 The most important disadvantage is the necrosis of the palatal flap that can occur following excessive rotation of the flap. Patient N. 3receivedbuccal flap surgery due to traumatic extraction of the first upper molar. The buccal pad of flap (also known as Boule de Bichat) is a simple lobulated mass covered by a thin layer or capsule located deeply along the posterior maxilla and the superior fibers of buccinator muscle [18, 19]. The possible functions of the BFP include the prevention of negative pressure in suckling newborns, the separation of masticatory muscles from one other as well as from the bone structures, the enhancement of intermuscular motility and the protection of neuromuscular bundles. The rapid epithelialization of the uncovered fat is a peculiar feature of the BFP flap stalk and has been confirmed by histopathological studies . In order to reach the BFP an incision of the posterior mucosa must be made in the area of the zygomatic buttress, followed by a light incision of the periosteum and of the fascial envelope of the buccal pad. A gentle dissection with fine curved artery forceps exposes the yellowish-colored buccal fat. The buccal fat pad flap, preferably of the pedicled type, has been used most commonly for the closure of the OAF. This is due to the location of the buccal fat pad which is anatomically favorable, to the easy and minimal dissection with which it can be harvested and mobilized. The fat pad provides a good rate of epithelialization and a low rate of failure . The disadvantage is a mild reduction in the vestibular height and a low rate of recurrence of fistulas requiring a second surgery in order to achieve closure. According to the literature and to the author’s clinical experience, any communication between the maxillary sinus and the oral cavity lasting for more than three weeks should be surgically closed in order to avoid further medical problems. 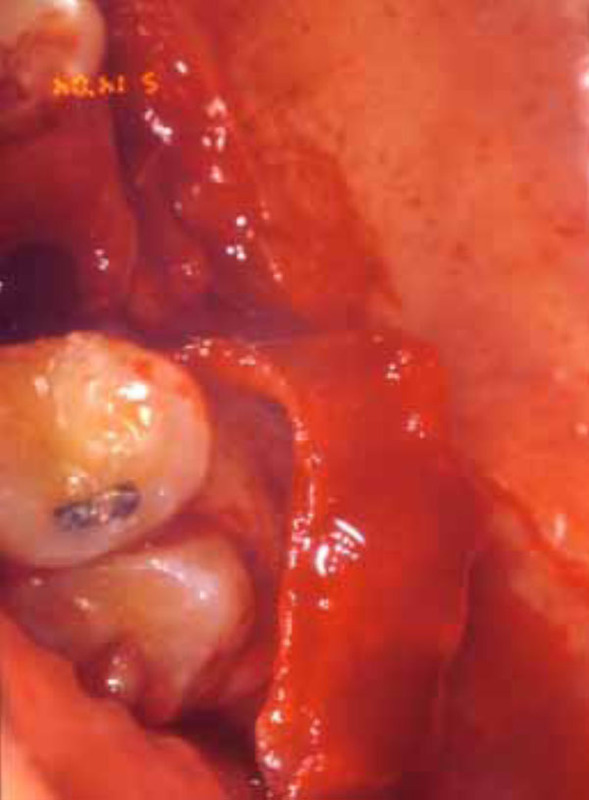 In choosing the surgical approach to treat an oroantral fistula, different parameters must be considered, including location and size of defect as well as its relationship to the adjacent teeth, height of the alveolar ridge, persistence, sinus inflammation and the patient’s general health. Moreover, any sinus disease must be cured to allow the fistula to close. Immediate repairs of the acute oroantral defect have a uniformly high success rate approaching 95% that decreases to 67% in cases of delayed closure. An important role in the healing process is played by the presence of sinus diseases. In these cases the advice of a specialist will help to deal with complications. Since a chronic communication between the oral cavity and the maxillary sinus can represent an access route for fungal penetration into the sinus, a systemic antifungal treatment must be used associated with abundant washings with saline and topical antifungal solution. Regardless of the chosen technique, two rules must be observed. First of all, any sinus infection must be treated with adequate nasal drainage. This kind of therapy might require a Caldwell-Luc procedure with nasal antrostomy or endoscopic sinus surgery. Briefly, this procedure consists in exposing the antero-lateral wall of the maxillary sinus. A hole is then opened in the bone through which removal of the infected mucosa can be achieved. This drainage will allow washings with saline or rinses of Cephalosporin solution to be performed over the few days following the surgery. Antibiotic helps to reduce infection in such a high risk situation. After drainage removal, the opening of the naso-sinus communication should be preserved to allow spontaneous drainage of fluids. The use of appropriate antibiotics in addition to topical and/or systemic decongestants is necessary preoperatively, along with nasal precautions (no nose blowing and no sneezing). The second rule to be observed requires a tension-free closure of a broad based, good vascularized soft tissue flap over intact bone. Treatment modalities to repair the oroantral fistula include local or free soft tissue flaps, with or without autogenous grafts or alloplastic implants. The closure of an oroantral communication of any origin, can be achieved by different techniques. 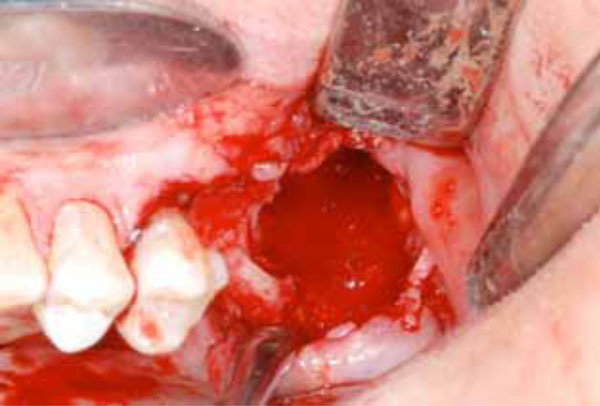 Particular emphasis should be made in choosing the most appropriate method The three operative techniques here reviewed are: buccal flap, palatal flap, and buccal pad fat flap, each having both advantages and disadvantages. The authors suggest the buccal flap for small and mesial fistulas, taking into consideration that additional surgery to reestablish the proper vestibular depth may be necessary. 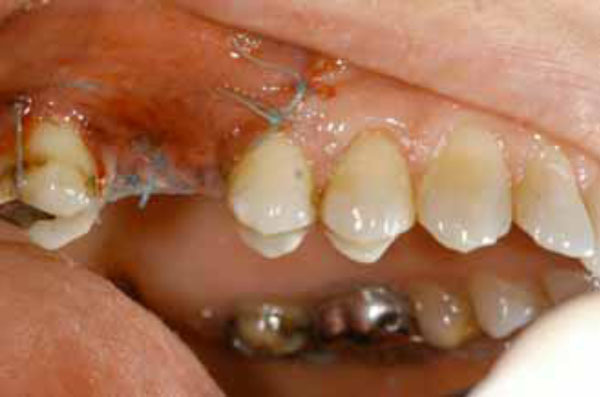 The palatal flap was found to be a feasible option for repairing OACs, particularly for defects in the premolar area. The technique is simple and familiar to the oral and maxillofacial surgeon. This procedure is highly recommended when an optimal length/width flap can be maintained. In recent years, the BFP has been used for a variety of purposes, owing to its physical and biological properties, and the results have encouraged clinicians to make use of its potential benefits. The most common use of the BFP has been in the closure of big posterior OACs, followed by post excision reconstruction. In order to obtain the best results, the size limitation of the BFP must be considered. Liversedge RL, Wong K. Use of the buccal fat pad in maxillary and sinus grafting of the severely atrophic maxilla preparatory toimplant reconstruction of the partially or completely edentulouspatient: technical note Int J Oral Maxillofac Implants 2002; 17: 424-8. Guven O. A clinical study on oroantral fistulae J Craniomaxillofac Surg 1998; 26: 267-71. Fickling BW. Oral surgery involving the maxillary sinus Ann R Coll Surg Engl 1957; 20: 3-35. Berger A. Oroantral openings and their surgical corrections Arch Otolaryngology 1939; 130: 400-2. Lin PT, Bukachaevsky R, Blake M. Management ofodontogenicsinusiis with persistent oro-antral fistula Ear Nose Throat J 1991; 70: 488-90. Amaratunga NA. Oro-antral fistulae. A study of clinical, radiological and treatment aspects Br J Oral Maxillofac Surg 1986; 24: 433-7. McGregor IA, McGregor FM. Reconstructive techniques inintraoral surgery In: Mcgregor FM, Ed. cancer of the faceand mouth. London: Churchill Livingst One 1986; pp. 412-9. Chonkas NC. Modified palatal flap technique for closure of oroantral fistulas J Oral Surg 1974; 32: 12-3. Salins PC, Kishore SK. Anteriorly based palatal flap for closure of large oroantral fistula Oral Surg Oral Med Oral Pathol Oral Radiol Endod 1996; 82: 253-6. Sokler K, Vuksan V, Lauc T. Treatment of oroantral fistula Acta Stomat Croat 2002; 36: 135-40. Baxhausen G. Closure of oroantral fistulae Ann Otolaryngol 1939; 48: 632-8. Rintala A. A double overlapping hinge flap to close palatal fistula Scand J Plast Reconstr Surg 1971; 5: 91-5. Stajcic Z. The buccal fat pad in the closure of oro-antral communications: a study of 56 cases J Craniomaxillofac Surg 1992; 20: 193-7. Rapidis AD, Alexandridis CA, Eleftberiadis E, Angelopoulos AP. The use of the buccal fat pad for reconstruction of oral defects: review of the literature and report of 15 cases J Oral Maxillofac Surg 2000; 58: 158-63. Tideman H, Bosdnquet A, Scott J. Use of the buccal fat pad as a pedicled graft J Oral Maxillofac Surg 1986; 44: 435-0. Hao SP. Reconstruction of oral defects with the pedicled buccal fat pad flap J Otolaryngol Head Neck Surg 2000; 122: 863-7. Dean A, Alamillos F, Garcia-Lopez A, Sanchez J, Penalba M. The buccal fat pad in oral reconstruction Head Neck 2001; 23: 383-8. 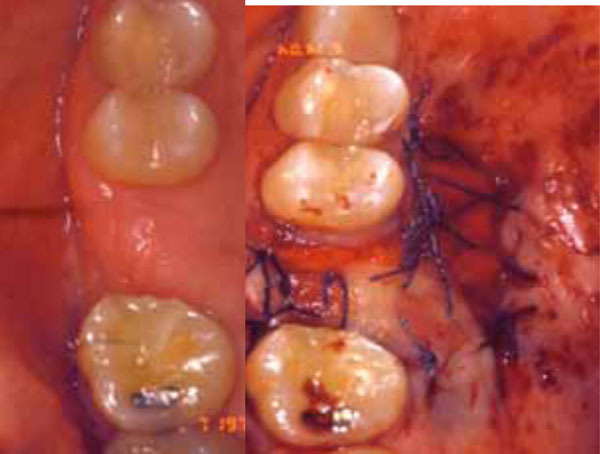 Fujimoto N, Nagura H, Enamato S. Grafting of the buccal fat pad into palatal defects J Craniomaxillofac Surg 1990; 18: 219-2. Hanazawa Y, Itoh K, Mabashi T, Sato K. Closure of oro-antrolcommunications using a pedicled buccal fat pad graft J Oral Maxillofac Surg 1995; 53: 771-5. Haraji A, Zare R. The use of buccal fat pad for oro-antralcommunication closure J Mashhad Dent Sch Mashhad Univ Med Sci 2007; 31: 9-11. Ferrari S, Ferri A, Bianchi B, Copelli C, Magri AS, Sesenna E. A novel technique for cheek mucosa defect reconstruction using a pedicledbuccal fat pad and buccinatormyomucosal island flap Oral Oncol 2009; 45: 59-62.